Times have changed. And the picnic, it seems, is over. The American president has embarked on a trade war with Canada (and much of the rest of the world) and fecklessly insulted the Canadian prime minister, who predictably has responded firmly and frostily, and the border watchdogs have clamped down. While it’s nothing like the situation on the southern border with Mexico, where the U.S. administration has separated thousands of immigrant children from their families and continues to insist that a wall be built across the entire border, it is beyond worrisome: It threatens one of the great political and cultural alliances between nations in modern times. When Roman was stopped she was processed for “expedited removal” and hauled off more than 120 miles south to ICE’s Northwest Detention Center in Tacoma, where she languished in a bureaucratic hell zone until June 5, when she was finally released again into Canadian authority. At that, she was lucky. Detainees along the Mexican border can be imprisoned for months or even longer, and families can be separated permanently. As frustrating and alarming as the current situation is, and as deeply as I regret the fraying relationship between the two nations I know best, I’m also not terribly surprised. The seeds of this schism were beginning to show in the middle and late 1960s, the last time the United States veered so closely into authoritarian waters, when I was in college in Bellingham. It was in the years when the Vietnam War was ramping up, and the beatnik movement was morphing into the hippie movement, and J. Edgar Hoover was still lording it over the FBI, and LBJ was neck deep in the Big Muddy, and Richard Nixon had a secret plan to end the war, and the think tankers of the nation’s capital were pushing us deeper and deeper into a senseless and destructive conflict, and Canadians, for the most part, refused to go along. The United States government can have a long and resentful memory, and factions of it no doubt have been suspicious of Canada ever since it went all dovey on the coalition. Canada is not a perfect country. No nation is. It has deep environmental problems, and a harsh history with its indigenous people that mirrors our own, and its own cultural prejudices. But when you grow up along a border you begin to understand how artificial and arbitrary the thing is, and also how creative a mix of cultures can be. I remember staying with an otherwise lovely host couple at a B&B in Stratford, Ontario, years ago whose detestation of Québeçois rivaled anything I’ve heard from white Southerners about African Americans. I also remember getting off a cross-country train from Vancouver to Montreal and falling in with a group of McGill University students who invited me to stay in their house for a week. It wasn’t until the third day that I realized their first language was French, and they’d been speaking English because they knew I wouldn’t be able to understand them otherwise. It’s that sort of everyday generosity, a national trait that seems common and rarely remarked upon, that gives a culture strength and honor. The United States offends such a people at its own peril. We’ve entered a period when giving offense is our position of choice, a point of pride, like Chihuahuas yapping at each others’ heels. Such attitudes have real consequences. It’s easy to blame Donald Trump for this, and in many ways utterly justified. But he can’t lead where we as a nation are unwilling to go. He’s tapped into the worst of our natural instincts, and given permission to the takers and users to indulge themselves. ICE, ICE, baby. Power is as power does. And the world turns away. We’ve done too much damage to ourselves. It’ll be a long slow journey back to decency, let alone leadership. 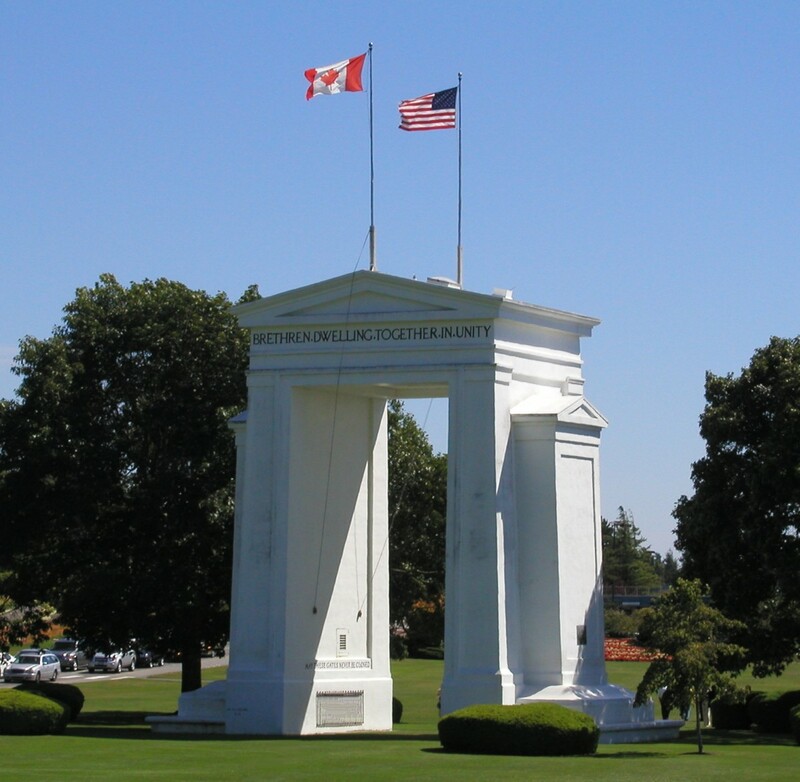 I’d like to think one good place to start is in the middle of the Peace Arch, one foot on one side of the line, one foot on the other. Friends first. Allies after. Independent, but together. Apologies, as to the Iroquois, for a flawed history we mean to overcome. 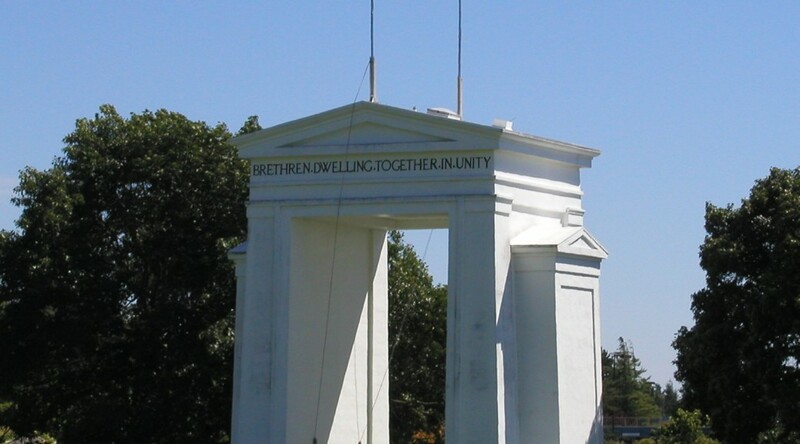 The arch was built almost a century ago, in 1921. Surely it, like the Statue of Liberty, still means something other than an ironic joke. We’d better hope so, and work to make it so. If not, hope fades. We’ll all be joggers, accidentally violating arbitrary lines. And we’ll have built our own cells for a long and deep detention. Well said, Bob! We share many of those memories of the ’60s and I made many trips into Canada over the following decades where I was always welcomed and always had some amount of hassle coming home.